This smoothie is considered to be very tasty and beneficial for the health. Before I get to the actual recipe, let’s take a quick look at the health benefits attributed to kiwis, strawberries, and bananas. The high amount vitamin C present in kiwis offers much in the way of antioxidant protection. Kiwis are also a good source of dietary fiber and potassium and contain trace amounts of other minerals and vitamins. Like kiwis, strawberries are rich in vitamin C, dietary fiber, and potassium, but also contain ample amounts of manganese, folate, iodine, magnesium, and vitamin K. These nutrients lead to the reduction of inflammation, good eye health, cardiovascular protection, anti-cancer properties, and promote strong, healthy bones. The good old banana contains many of the same nutrients as strawberries and kiwis. Bananas support a healthy digestive tract with proper elimination, good cardiovascular health, bone health, eye health, and help prevent cancer. 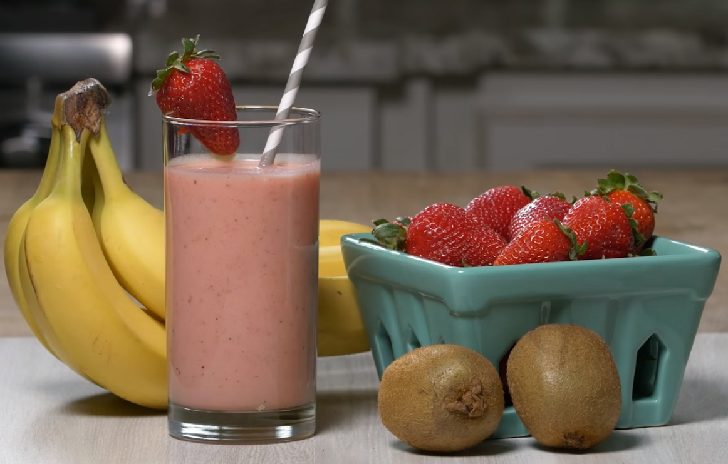 The Kiwi Strawberry Banana Smoothie Recipe is a perfect drink, I only started to do this a few days ago, and now I have the whole family enjoying the smoothie. The other products or equipment needed to make this smoothie include blender, cutting knife as well as measuring cups. First of all, it is important to collect all the ingredients for making this smoothie. Then you have to put the milk along with the yogurt in the blender and blend it. Now you have to make a mixture of strawberry, sliced banana as well as kiwi into the blender and then add flax-seeds into it and blend the mixture for 3-4 minutes. The smoothie is now ready to drink.